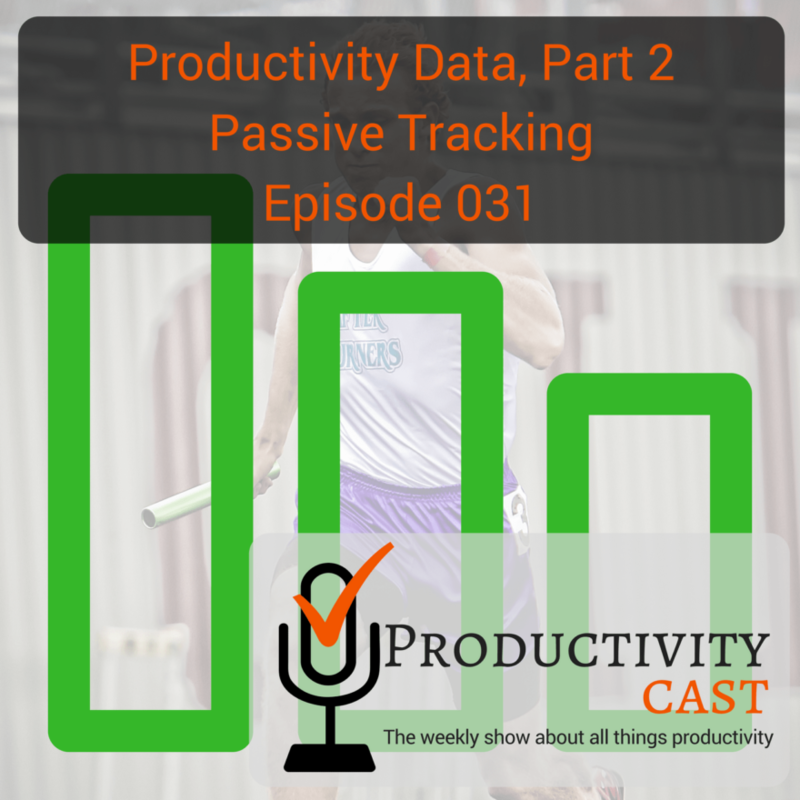 In our last cast, we discussed the power of active tracking for greater productivity. If not, it’s highly recommended you go back and listen to that cast first. You will learn about empowered choice and for that alone, the previous cast is worthwhile. Today on this cast, we discuss the importance of taking charge of the passive data being collected about you already and learning to track data that you can use productively without having to do all the work. In contrast to our active tracking discussion, we delve into the world of ambient data ripe for the picking, if you know the right ways to do so. Also, the pitfalls, perils, and opportunities that abound with passive productivity/wellness data tracking. Pull up a seat and join us for this important and timely discussion on passive tracking for productivity. Raw, unedited and machine-produced text transcript so there may be substantial errors. tracks my time. It’s called manic time. I think it’s mentioned in the show notes and it’s one that I set up and it tracks all of my basically my keystrokes and what I use my computer to do out call that passive, to some degree, even though I set it up. But the fact is I have to go in each week and actually assemble a full record of my time because I’ve been tracking my time for for years because my time doesn’t track time. For example, when I’m in a meeting that doesn’t involve my computer or when I’m on the road or when I’m doing some reading that’s offline or away from my laptop so I have to supplement it. So there’s some there’s some active and passive that I have to do tracking I have to do in order to create an accurate record of my my week but that’s the one that I that I use the most that question. And what do I use it for and that’s that’s as appropriate get into the next, I believe. Okay. The difference for me between active and passive tracking is actually pretty simple. It’s a matter of does whatever I’m tracking require me to remember to push a button. If it’s active obviously I need to make a conscious effort to start and stop the tracking process if it’s passive. I don’t have to think about it, it’s just going to happen and somewhere in the middle there are the actively passive tracking things where I start something tracking, but it will keep tracking and change state depending on what the state changes. So if I bucket this stuff active tracking is like a time tracking tool, something like in fresh books for example where I go in and say this is where I’m starting to work this is what I’m stopping to work done on the other end of the scale something that’s completely passive maybe location tracking within Google to identify where I’ve gone within different places in the middle is things like my fitness tracker like a gusto was talking about where I say it’s always kind of tracking things like my pulse rate and activity level for walking around, but if I’m exercising I push a button to started tracking the different types of exercises that I’m doing. So for me, there’s kind of three areas, but it’s still boils down to. Did I remember to push the button or not. data that I’ve collected, as I said, it goes back several years. wiggle room that gray area that becomes a skewed. Yes. He wanted when I think about this type of data piece of the equation. People often get themselves out of sorts, when they start to look at the amount of data, they have available to them and then ask the question, What can that data. Tell me honestly that’s backwards, if you approach it that way you’re only going to come up with answers that the data set that you’re gathering can provide you doesn’t mean that those are the answers that you need. I always recommend to people start the process backwards. What’s the information that you need to know what are the answers you need to get to, am I wasting time on these types of tasks. What am I spending my time properly ask those kinds of questions and then work back backwards to say what information do I need to be gathering to get to those answers and what’s the most efficient way to gather that information is it actively tagging items. Is it actively going through and starting and stopping the clock is running things in the background is it finding an app that if you work backwards. You have you are then able to address this plethora of different ways of capturing data that we have available to us, but we can still evaluate that all of those captures are going to allow us to process the infirm information in a way to get to the report output that we need for our own decision making and it’s really easy to fall into the reverse trap you hear this in corporate space all the time. Well, what do you want to know from the system. Well, what can you tell me. Well, I can tell you whatever it can generate that doesn’t mean that any of that is valid relevant or important it’s a matter of what questions do you need in answered and work back to do I have the information to answer those questions. So I’d like to point out here that just sort of answer the question why track your data passively art you kind of answered the question and I want to kind of put an exclamation point on that which is decide on the data you need in order to be able to make that empowered choice in in the future, about how to change your productive life and that’s the data, you should seek out. Now, a couple of caveats here I think are important, which are just say that one you need to be aware of that the data you think on the surface that will help you won’t necessarily be the data that you need in order to make an empowered choice I give I’ll give the example of of health and fitness here which is that you know something as simple as tracking the number of steps is is not going to stop you, your physical health status. Right. So while tracking steps might be something to motivate you to actually walk more that’s not going to give you a good understanding of how healthy you are right. So, so be very, very cognizant of the fact that you might have, you know, a different perspective on or different view on what you want and you want to be able to track the right data for the right things. So if I was saying, Oh, I want to know my general heart health. Well, you might get a fitness tracker that tracks your your heart rate and tracks that throughout the day passively right and that will give you a better view than the number of steps you take daily right because if you say oh well I take, you know, 10,000, steps a day. My heart is really healthy but it’s really not. You don’t know that from the number of steps that you’ve taken right so just be aware that you have to do a little bit of thinking about what’s the what’s the answer. I’m trying to what’s the question I’m trying to answer and tracking the right data appropriately. but but the way I’m using manic time doesn’t require this mystical background at all because now I’m really just getting feedback on my time usage. That’s about it. we went up a little bit more than it should have and well what was happening there what what triggered that spike or what triggered that drop and that’s that aha that I go back to, but I’m not spending an hour every day analyzing every bit of that data. So when I look at the passive data and the amount of passive data that’s getting collected and then I that I allowed to collect and that I’m actually aware, I’m collecting which is a whole different conversation. running errands better routes to do that and that’s is that realistically happening. No, why because the value of that does not offset the amount of cost. I have to spend in time to get to that in dancer. So when I look at the things that I’m passively tracking again you know all that background stuff if an app says it’ll track this stuff. Go ahead. What the heck, it’s not gonna hurt me any if anybody really wants to know what my average pulse rate is per day. Fine, feel free. I’m sure you can make the argument. Oh, well, you know, healthcare companies will want to know that and insurance companies will charge you more and I’ll make the argument back. Yeah, that’s fine. They’ll find a way to charge you more regardless of the data that you’re passing to them. So with that being said, no offense to the healthcare people in the audience. yeah I care what you’re saying and I happened to be a fairly focused on the numbers person and so that that makes a lot of sense that since I am kind of hyper focused when it comes to that kind of stuff at least as it relates to my personal productivity. I spend a lot of time paying attention to my health data and as I said in the last cast you know i’m i’m very active in the quantified self world and as a quantified self or q self or I like the idea of knowing as much about my health and wellness and how it how it improves or holds me back from being productive, right. So, whether that be nutrition sleep or fitness and I want to make sure I have that data at hand to be a kind of a feedback loop, but now it’s a it’s a it’s a longer feedback loop than say in immediate you’re doing the right thing or doing the wrong thing right now but that in my weekly review at least tells me each week how the data that’s being passively track tells me how to present myself in the next week more productively right so I know that I actually have if you if you start to look at the ebb and flow of your month I have highly productive weeks and I have very low productivity weeks. And what I mean by that, in essence, is that those low productivity weeks are high travel weeks and therefore I can’t do a lot in between moments of silence because I’m running from here to the airport or I’m in the car driving to a client site or something like that where my The, the ability to track actively is not as easy and the ability for me to say drive and type is not legal. So, but but safety and in mind you know it doesn’t make any sense either I go ahead and I take those productivity hits and I am aware of them. And so, you know, it’s like that kind of data really does help me. It really helps me look at it and it’s it’s like a glance you know it’s just a glance at your at the reports as long as you understand how to set them up correctly before we move on and talk about the apps, because I think there are a lot of them out there that are really helpful to folks in terms of being able to track this data. I didn’t want to I want to talk a little bit about I see I sound like the Debbie Downer on this cast of all the things you should be worried about. But, but I’m going to talk about it because I think it’s important and that is data fatigue and data overwhelm and this is the idea of either tolerating or avoiding data and what they tell you to do or what maybe Cass Sunstein and Richard Fowler, who wrote the book nudge they would call this a nudge nudge or things that nudge you the the idea here is that you start to salary to avoid them because of fatigue and overwhelm. Okay, so be aware that too much data can be a bad thing. Get Data indigestion. Don’t try to take on too much passive tracking because if you have all of that data and you attempt to understand it all all at once, or in a way that it’s not organized it will really start to turn you off. And I think the way you’ve approached art which is it’s collected and if you look at it. Great. If you don’t, who cares, that’s a kind of good you know laissez faire nonchalant perspective about it. And I think that’s probably good. If you’re new to data tracking and you don’t want to get overwhelmed. I want to take us on to our final segment of the cast, which is I’d like to talk about the apps and that are available and that you use for passive tracking and what areas of your life. Do they track and and so I’m going to start off with just a couple of them because I think these are really just phenomenal. So I’ve started using an app called Instant and it’s available across iOS and Android and instant is a smartphone application and it automates the tracking of several different areas of your of your world now it doesn’t do all of these to some high degree of accuracy. So don’t don’t start you know writing into us and telling us how you know bad, the data is it is a very new app and all of these apps that fit into this category are going to be to some extent inaccurate to some time level, but it can be helpful and informing I think in some ways, but instant is great because it tracks screen time of your mobile device. And so what I what I recognized over time was that while using a desktop based tool that tracks your desktop usage. You know, we toggle between our mobile devices and our desktop devices and tablets and so forth throughout the day and it’s actually helpful to have a full picture of your productivity and so on the mobile devices. I have instance, so it shows me how many times I have, you know, looked at my phone, you know, how many times have opened it, how many times I’ve what applications. I used on it right was i was i on Words with Friends when I should have been doing an email right. and the health tracking but aside from that, I probably should do more, just not quite sure what would be the best way for me to approach it specifically because I switch systems, a lot I do as much work on my phone as I do on multiple web browsers on multiple machines. I’m constantly bouncing back and forth between systems. If I was always working off of one platform device, it would be a lot easier, but I just don’t have that option. yeah I think geo geo tracking in general and geo fencing in your case gusto is is a very powerful way in which you know it’s, again, it’s not it’s not about the fact that it’s collecting that data right so data collection is important but it’s really the fact that it understands it and then it provides an intervention. It says, Hey, you said that you wanted to pick up this thing at the grocery store and you’re at the grocery store. Here it goes. That thing you wanted to pick up and I think that’s, you know, highly productive and highly useful. And so I want to I want to talk about a couple of other things that could be useful to folks just a couple of applications. I’ve come up with over the course of years and I’ve noticed that people use so there. There are several applications like the one that Francis uses that tracks your desktop time, the one that I’m most familiar with is rescue time and again links to all of these are in the show notes and rescue time does the, the, the, you know, analysis of what’s happening on your you know your computer and so it can track what websites and it can even block certain websites throughout the day. And so you can say, Oh, well, I don’t want to look at Facebook from 10 to noon, because that’s my highly productive time during the day. So you can actually have rescue time block Facebook during that time frame. There are other time tracking applications that again it just basically analyzes what applications are running and which ones are in focus or out of focus throughout the day time dr work pulse and work snaps all do that kind of functionality. There’s a tool called procrastinate tracker and this is for Windows only but procrastinate trackers is one of those that I’ve seen that does some interesting passive tracking and then one that I thought was really helpful was one called work rave and work rave does repetitive stress injury prevention. So it actually pays attention to what you’re doing on your mouse and keyboard and then it provides interventions for being able to do that, but it can also it at the same time it’s passively tracking your mouse and keyboard activity. So that’s also helpful that’s free software and it’s it’s windows only so I want I wanted to just pay attention to those also if you’re a small business owner and you’re you want to hire freelancers up work up work calm, they have this built in to their platform. So what’s really interesting is that while work Polson works naps and manic time and so on so forth. They’re really for managers to record what their employees are doing right in terms of how they’re spending their time they take screenshots of what’s of what’s happening on screen on a regular basis so that it can then you know you can sort of keep a try. Lack of record of what your staff is doing and therefore keeping honest people honest, in essence, well up work does the same thing. So if you’re hiring freelancers. This can nominally do the process of hiring and managing those freelancers. But it also has this additional functionality that if you hire someone for hourly work they’re actually doing an hour’s worth of work and not doing the work in five minutes and charging you for an hour. That’s kind of a cool concept there. There are some other notables that I’m going to put into the into the the links in the show notes so you can go check those out. Yeah, I want to echo something that I’ve said before in a big way which is that we’ve all been saying that you need to sort out the the objective before you actually I think even think about the app or passive versus active. But what I found is that there’s what I found is that there’s hardly any help on the on the web in terms of setting up their original problem and then looking for the right app and then looking for the right way to collect the data that whole process which is what’s Moses discourses don’t teach until the very end is actually the most important the original setting up with the problem. And that’s the part I think people, people don’t do and therefore end up with more data than they know what to do with because they haven’t structured the problem accurately or usefully in the first step I wish there were more sites more and more and more apps or is there the right answer to that, but more assistance, I guess so that people who have real problems could then ask the question. Okay, what’s the problem I’m trying to solve. What’s the app I need to get what’s the data I need and take them all the way from the source of the problem to solving the problem using the data. So I wish there were more help, like that. I’ve never seen a site that does that. Well, hopefully somebody is listening and they will we’ll create such a site. Well, I think this closes out this cast for productivity cast. If you have been tracking data passively. This is a great opportunity to look at the health data, you know, Google Fit or Apple Health and seeing what the data has been collected and is is informing you about and maybe that can help you create some motivation to changing things into the future. So with that, I’m going to close us out for this episode of productivity cast the weekly show about all things productivity. Thank you to Augusto Pinaud, Francis Wade and Art Gelwicks. Thank you, gentlemen. And here’s your productive life. And that’s it for this productivity cast the weekly show about all things productivity with your hosts Ray Sidney-Smith and Augusto Pinaud with Francis Wade and Art Gelwicks.